TPA Chuck Wagon: Pet food to be delivered to homebound Meals on Wheels recipients. No Pet Left Behind: Partner with Hospice to help care for pets in the homes of patients. Will take and re-home pets if there is no family member available to assume care of pet when needed. Mother Hubbard’s: Pet food bank Cupboard. PopStars / “Pets On Parade”: A page dedicated to listing shelter pets that need a little extra exposure to find their new forever homes. We will also have a section of lost & found pets where people can post pictures of pets they have lost or found. A Spot for Spot: Will provide free doghouses to outside only dogs that have insufficient or no housing, and shelters for feral cat colonies. 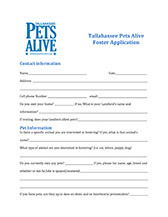 T-FANs: “Tallahassee Foster/Advocate Network” is an extensive foster network to assist local rescues, and the shelter. 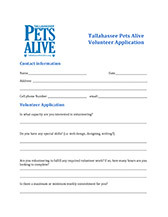 Florida Pets Alive Pet Rehoming Program which is available to all Pet Owners in the area. We will Market your Pet if you continue to home and vet your Pet until they are Adopted. • We will process any Applications on your Pet and you will collect your regular Adoption Fee from the New Owner. • Please email mail us a 1 pager on the Pets you want to add to the TPA Pet Networking Program so we can post and copy for the Pet Adoption Event. 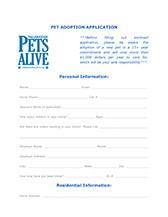 Please include direct contact information and your Adoption Fee on the 1 pager. Please consider #donating local by clicking on the Donate Button under Donate Online in the sidebar. The First Saturday Event is coordinated by Florida Pets Alive Inc.; we are available to work with all rescues, shelters and individuals in the area to increase the adoption of pets.